Performed by Nicholas Kitchen, violin, Yeesun Kim, cello, and Meng-Chieh Liu, piano. The concert series at St. Stephen's Episcopal Church rivals any in the Triangle for musical interest. Its intimate venue, with modern stained glass, is ideal for chamber music. 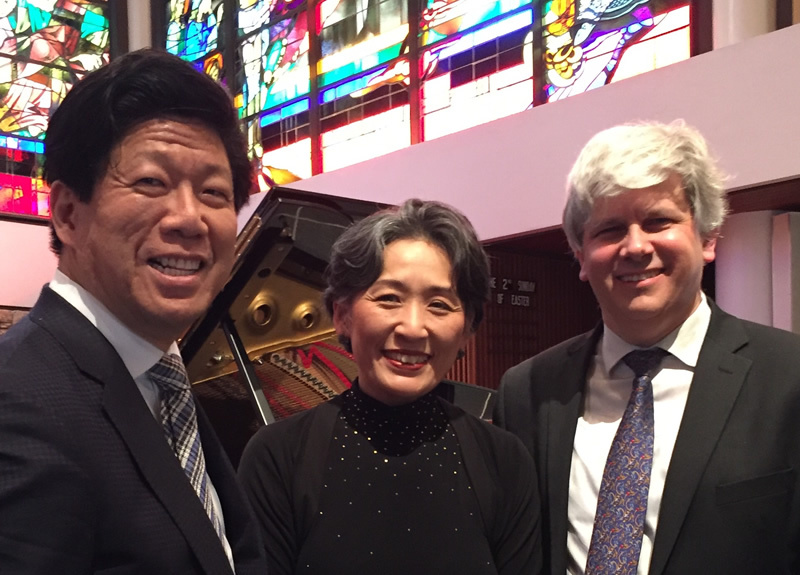 The return of its native son, violinist Nicholas Kitchen, whether as leader of the Borromeo Quartet or with his wife, cellist Yeesun Kim, and pianist Meng-Chieh Liu as a piano trio, was a cause for excitement. This concert featured music by Franz Schubert (1797-1828). The presence of pianist Liu enabled each string player to be heard as a duo in addition to all three in the great First Piano Trio. The concert opened with the arrangement for cello of Schubert's Sonata in A minor, D.821 ("Arpeggione") (1824). Johann Georg Staufer of Vienna invented the Arpeggione* in 1823. It is a six-stringed, fretted bass viol played with a bow. Only one major performer-exponent took up the instrument – Vincenz Schister, who inspired Schubert to compose this sonata. This cello transcription is all that survives of the arpeggione's repertoire. It is in three movements. The Allegro moderato juxtaposes a melancholy theme against a second theme which allows the cello to soar. The Adagio features the cello in a hymn-like aria. A folk-dance-like theme alternates with melodies in the concluding Rondo. According to the program notes, Kim used a Henle cello score except for a few passages played an octave higher to conform to the composer's manuscript. Kim and Liu gave a gripping performance of great intensity and expressive nuance. Despite having the Steinway's lid fully raised, Liu's sound was perfectly balanced, never once covering Kim's full, rich cello tone. Her intonation was ideal, and her spinning of Schubert's melodic line was seamless as her concentration swept the listener up in its wake. The concert continued with Schubert's haunting Fantasy in C for violin and piano, D.934. The slow introduction, with colorful piano tremolos and repeated chords, supports a long-arched violin cantilena leading to the allegretto section which plays with tonality between A minor and A major. Schubert's atypical use of trills, broken filigree, and high-position melodic playing has been attributed to the example and influence of Niccolo Paganinni. Schubert's song "Sei mir gegrüβt," D.741, serves as the basis for the set of variations in the concluding Andantino. I half expected to see smoke arise from the bridge of Kitchen's violin; he bowed as if possessed during the fast-paced allegretto portion! Every arrow of the virtuoso's quiver was tossed off with aplomb. Again, Liu's keyboard was perfectly balanced as he played with comparable intensity. The crystalline clarity of his playing was a constant delight in all three works. The refined range of Kitchen's dynamic palette was marvelous. I will long remember the white-hot intensity of this duo's performance. In a review of Schubert's First Piano Trio in B-flat, D.898, Robert Schuman wrote, "One glance at Schubert's Trio and the troubles of our human existence disappear and the whole world is fresh and bright again." The much beloved and well-known piece is bursting at the seams with melodic beauty, rhythmic inventiveness, and full, rich Romantic harmonies. The composer plays with traditional forms by using false starts in the first movement, toying with tonality in the second movement, or expectations in the concluding Rondo. Based on the high level of the opening two duo performances, the Liu, Kitchen, and Kim trio more than met high expectations. I have lost count of the number of performances of this trio I have heard, but this one will long resonate as unsurpassed. Balance among the three players was perfect, as was their intonation. String tone and playing style were beautifully matched. The intensity and impetus of their playing brought a freshness to Schubert's repetitions. Never miss a chance to hear these musicians in either duo or trio repertoire! *Richard Freed, in his program note to Lynn Harrell's RCA (6531-2-RG) recording, describes the arpeggione as having "the flowing, angle-free shape of the guitar, but about the size of a cello; its fingerboard had guitar-like frets, and there were six strings, tuned like those of a guitar, but since they were to be bowed rather than plucked, there was a cello-like bridge; the tuning pegs were cello-type as well."